There are usually two belts on most two stage snowblowers. 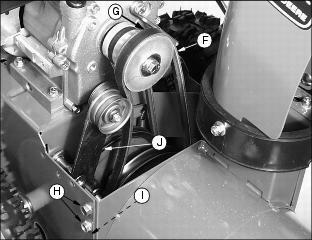 One belt is required to drive the auger while the other belt is required to drive the wheels. They usually last for quite a few years however on older snowblowers operators should check them on an annual basis looking for wear and tear, abrasions and cracking. It is fairly easy inspecting the belts on your snowblower and we recommend that you open your manual and confirm the location of the belt cover and how best to remove it. The plastic belt cover is secured by two bolts which can be removed using a small wrench. Once you remove the belt cover on your snowboard, inspect the belt for cracks and where. Replace the belt if needed. If you’re going to replace the belt take a picture first so that you can refer to it when you’re installing the new belt and you want to refer to it and install it exactly as removed. If you’re finding that the forward motion of the snowboard is slowing down under heavy loads, or the snow is not being shown as far as it normally would there’s a chance that the older belts have begun to stretch. There are two ways to deal with this problem. The first is to adjust the pulleys to make sure that the belt is tight. You will notice the belt tightener probably has an adjustment to allow you to tighten the belt. The second alternative is of course to replace a belt. Make sure that the replacement belt is the right size both in diameter as well is in the width and depth of the belt.